"Cyanide" is a song by American heavy metal band Metallica, the third single taken from their ninth studio album, Death Magnetic. On September 1, 2008, it was made available for streaming on the band's official website, as well as a download (for Platinum Members only) from the Death Magnetic website Mission: Metallica. It has since been made available for purchase as a digital single in the iTunes Store. The song was played live for the first time on August 9, 2008 at Ozzfest in Dallas, Texas and was the first song from Death Magnetic to be performed live in its entirety. An audio recording of the performance is featured on the band's MySpace page. Song was also performed live on Later...With Jools Holland in 2008. 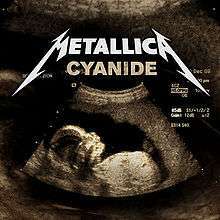 "Cyanide" became Metallica's seventh number one hit on the Billboard Hot Mainstream Rock Tracks chart, in March 2009. It is also their second consecutive number one on that chart from Death Magnetic, making the album only the second of Metallica's to spawn two number one hits on the chart (1996's Load being the first). It is also the band's fifth top twenty hit on the Billboard Hot Modern Rock Tracks chart, peaking at #19. The song peaked at #50 on the Billboard Hot 100 from high digital sales due to being released as a digital single prior to Death Magnetic's release. ↑ "Cyanide - Single". iTunes. Retrieved February 15, 2013.